Pure white with a lace white fringe. Absolutely beautiful, perfect for any occasion. Mid season flowering, 40cm. Fringed tulips are relatively new to the tulip range and are very popular. The edges of the petals have tiny spikes which give them a crystallized look. 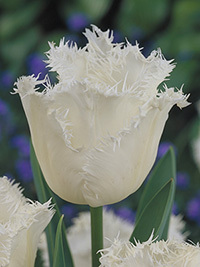 The unique shape of fringed tulips will add an amazing textural element to your garden.